Lucas Perez scored twice to help West Ham blow away Cardiff 3-1 as Joe Ralls’ penalty miss proved costly on Tuesday, writes Sky Sports. Perez came in from the wilderness to score twice (49 & 54) after replacing Marko Arnautovic, who limped off with a hamstring problem. Michail Antonio added a third (61) before Josh Murphy (90+5) registered a late consolation for Cardiff. It was former Arsenal striker Perez's first Premier League goals since January 2017 as West Ham made it back-to-back wins after turning over Newcastle on Saturday. It could have been very different if Ralls had not spurned his chance from the spot just before the break at 0-0 but West Ham goalkeeper Lukas Fabianski guessed right. Both teams started with a confident swagger after their respective wins at the weekend but it was West Ham who created the early opening. 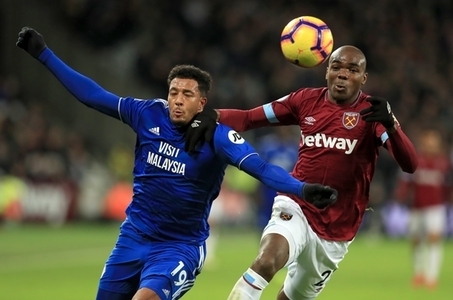 Angelo Ogbonna had a close-range header turned over the bar by Neil Etheridge while Arnautovic had an effort cleared off the line after rampaging through the Cardiff backline. The frustration of missing that chance may have affected Arnautovic's decision-making on 35 minutes when he barged over Junior Hoilett in the box. The West Ham striker was a relieved man when Ralls' weak penalty was easily saved by Fabianski. Arnautovic's eventful evening came to end just before the break when he limped off with a hamstring injury. His departure seemed to knock the Hammers, who looked short on ideas until Perez struck just after half-time. Robert Snodgrass produced a deft touch behind the Cardiff defence and the striker powered a finish past Etheridge, who could have done better. Confidence was now flowing for Perez after a frustrating period of his career since moving to the Premier League - he doubled up six minutes later. This time it was Arthur Masuaku who opened up Cardiff and his pass was finished by the striker - once again, Etheridge will have been disappointed with his effort. Antonio completed the scoring blitz six minutes later when flicking home a Snodgrass corner after Cardiff went to sleep from the set-piece. Apart from a scrappy late Murphy goal, Cardiff had little in response. After an impressive win at Wolves, it's back down to earth for Neil Warnock's men. West Ham: Fabianski; Antonio, Ogbonna, Diop, Masuaku; Noble, Rice, Snodgrass (Diangana, 76); Anderson, Arnautovic (Perez, 40), Hernandez (Carroll, 64). Subs not used: Adrian, Balbuena, Zabaleta, Obiang. Cardiff City: Etheridge; Manga, Morrison, Bamba, Bennett; Arter, Gunnarsson, Ralls (Mendez-Laing, 64); Camarasa, Hoilett (Murphy, 64), Paterson (Harris, 70). Subs not used: Smithies, Peltier, Decordova-Reid, Madine.